Robert Fisk: War is the “Total Failure of the Human Spirit” | Democracy Now! Veteran Middle East correspondent, Robert Fisk of the London Independent discusses Iraq, the media and what gives him hope. During the thirty years that he has been reporting on the Middle East, Fisk has covered every major event in the region, from the Algerian Civil War to the Iranian Revolution, from the American hostage crisis in Beirut to the Iran-Iraq War, from the Russian invasion of Afghanistan to Israel’s invasions of Lebanon, from the Gulf War to the invasion and ongoing war in Iraq. Robert Fisk, speaking in Santa Fe, New Mexico, September 21, 2005. AMY GOODMAN: I asked him his assessment of the current situation there and what needs to be done. ROBERT FISK: Three days after the Americans came to Baghdad, I said the real story is about to begin and that is the story of war against American occupation. A lot of my colleagues thought that was very, very funny — they hooted at me with laughter. But they’re not anymore. Look, apart from the Kurdistan area, Iraq is in a state of total anarchy and chaos. No roads are safe outside Baghdad. Much of Baghdad is in insurgents hands. Only the little green zones, the armored hotel areas where the westerners live and swim, and some cases don’t even leave their rooms, and that applies to many journalists, only here are people allowed to have the illusion that things are getting better, things are improving. Outside in the streets where some journalists still go, including, for example, my colleague Patrick Cockburn of the Independent and myself and the Guardian Newspaper, not most Americans though one or two. Out in the streets where few of us go is hell on Earth. I managed to get, a couple of weeks ago, to the mortuary in the city of Baghdad. As I often go in the past, counting the bodies of midday and midsummer out in the heat. There were 26 by midday. Nine had arrived by nine in the morning. I managed to get the official figures for July for the total number of violent deaths in Baghdad alone. The figure was 1,100 violent deaths, men, women and children. Shot, butchered, knifed, executed, death squad killings. A figure which, of course is not given out by the Iraqi Health Ministry and certainly not by the occupational authorities. We now have a situation in Iraq where there is a full scale insurgency by both the Shiites and the Sunnis against western forces. Once an insurgency of that kind starts in a Muslim country, it is impossible to quench it. Sorry, you guys can we put the book back? Let’s start again, we got it wrong at one point. You can’t do that. You can’t do that. I was discussing with an Iraqi friend three weeks ago in Baghdad what he thought the answer was. He said, “There is no answer. You’ve got to go. You’ve got to go.” I wrote at the time that I thought it was a terrible equation in Iraq. It goes like this. The Americans must leave. And the Americans will leave but the Americans can’t leave. And that’s the equation that turns sand into blood. Once you become an occupying power you take upon the responsibilities for the civilians which we have not done but you also have a responsibility to yourself. You have to keep justifying over and over and over again to your own populations. You were right to do it: ok, there were no weapons of mass destruction but we got rid of Saddam; ok, we haven’t gotten the electricity yet but there will be a constitution. Well, we hope. And we did have elections. Remember them in January? And all the time people die in ever greater numbers. Remember that figure for July that’s just Baghdad. What does that mean for the whole country? 5,000 dead? In July? What does that mean in the whole of Iraq in a year? You see the problem? We’re talking a 50,000, 60,000 dead a year now. The worst figure we’ve heard is 100,000 since 2003 yet still we don’t get statistics. When individual journalists have to go to hospital mortuaries and count the bloated corpses on the floor, you have know you’ve got problems. The last time I was in Baghdad I began to ask myself whether the dangers — and I’ve never done this on any other war except for the Algerian war which was very similar in many ways, questioning whether the dangers of covering Iraq are any longer worth the story. I suppose I think they are. But I guess having looked at my face in the mirror occasionally and seeing the gray hairs, I wonder if I should keep going. I probably will, but I’m not sure. 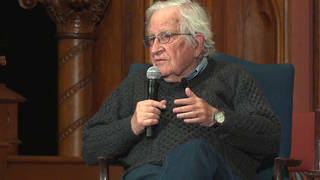 AMY GOODMAN: Robert, what about the number of journalists who have died? This weekend there’s going to be a major anti-war protest in Washington, on the 24th, and all over the country. One of the people or two of the people who will be there are the mother and brother of Jose Couso, who is the Spanish cameraman killed at the Palestine Hotel, the day before the U.S. Forces pulled down the statue of Saddam Hussein in Fardus Square. ROBERT FISK: No, it was the same day. It was the same day. The same day. It was the first armored division tank. It was the American tank that killed him absolutely, but it was the same day. AMY GOODMAN: Now, he is one of scores of people, of journalists who have died most recently. Reuters photographer killed, his colleague arrested by U.S. Forces and held, another IS being held at the Abu Ghraib prison. Dozens of journalists. What about your colleagues in Iraq right now? ROBERT FISK: The total figure of journalists who have died during and after the 2003 invasion up to date is now 68. The most recent being an Iraqi stringer again from The New York Times in Basra who was found dumped in a waste heap, executed with three bullets through the back of his head. I suspect the “Iraqi police” killed him like I suspect the Iraqi police killed the American journalist in Basra. Look, there’s no doubt it’s becoming the most dangerous story for journalists anywhere ever. If you want to look at the worst period it would be in Bosnia in 1992 when a lot of journalists who had never been in wars before were sent in to Bosnia and were dying at the rate of dozens a month. That was primarily, I think, because they were sending in very young men whose experience of war was Hollywood where the hero, of course, always survives. And what is shocking about this is that almost all the journalists are being killed, almost without exception in Iraq, are experienced in many cases, middle-aged guys who have been under fire many times before, who know about the lethality of weapons and whose jobs and lives are simply no longer respected. I’ve never been in a war like Iraq war in which our lives are so endangered, so targeted by all sides it sometimes seems. And I’m not sure what we can do about it. The American correspondents, some of them are guarded by armed Iraqis. The New York Times has a compound with four watch towers and armed Iraqis with ”NYT” New York Times on their black t-shirts. NBC lives in a hotel in the Karada District with iron grills. The A.P. lives in the Palestine Hotel with two armored walls. Very rarely do they ever venture out and never do the American staffers go in the streets. As I say, we still go out with Iraqi friends. We actually go out to lunch in restaurants in Iraq. But I think that’s probably because as long as we’re with Iraqis and we look at our watch and say, 20 minutes, finish the meal, half an hour, got to be out. You’re ok but it’s a calculated risk. As I said, I’m not sure the risks are worth it anymore. Our lives are worth nothing to the insurgents. Our lives appear to be worth virtually nothing to the Americans or the British. I think that when you reach a stage where our lives and our jobs are simply no longer respected, you do have to ask the question, is it worth it anymore. I think it is because I think Iraq is an appalling tragedy. Primarily for Iraqis, of course, who we don’t put at the top of our list. We say 1,900 Americans, 93 Brits or whatever it may be. It’s the Iraqis doing the suffering and the dying in fast numbers. Many of them because they trusted us and took our schilling and wanted to work for the police or wanted to work for construction companies building landing strips for the Americans or fortresses for the Americans. But I think the whole Iraqi story for us as journalists is becoming almost impossible to cover. Certainly if you have a journalist who lives behind two armored walls of the hotel who just used a mobile phone to call British or American diplomats behind another concrete wall, you might as well live in County Mayo, Ireland or Santa Fe, New Mexico. There’s no point in being there. And for example, the last trip I made outside Baghdad it took me two weeks to arrange it to go down to Najaf. It was the most fearful trip. I drove the road with three Iraqi friends. One of them a Shiite proleter, a clergyman, a religious man. All the checkpoints of the Iraqi army had been abandoned. This just after George Bush says the Iraqi army is in the field. There were up-turned Iraqi police cars, burned-out American vehicles. I didn’t see a member of the Security Forces until I reached the outskirts of Najaf about 80 miles from Iraq. The whole of the countryside outside Baghdad is under the control, is now the property of the armed insurgents both Sunni and Shia. This, we are not being told. This, president Bush will not acknowledge. This, our own dear Mr. Blair will not acknowledge. And that is part of the tragedy. And it seems now to be part of our life that New Orleans flooding is not real until it’s real, that the collapse of Iraq is not real until it’s real. With such poor television coverage, although we did get good pictures I noticed, of the British soldiers on fire, for heavens sakes in their armored vehicles. I don’t know if it’s possible to explain what is happening in Iraq anymore. Most journalists, western journalists are relying upon Iraqi stringers, Iraqi correspondents to risk their necks on the streets. And they are risking their necks and they are dying for it to bring in the news. But there are no by and large — by and large there are no westernized, independently journalists on the streets unarmed. My newspaper does not have protection. We do not carry weapons. But my goodness, as I say, I don’t know how long we can continue doing this. Each time Patrick and I go to Iraq it’s a little bit worse. And when we look back at what it was like a year ago, which was considered appalling, we’re amazed at how free we were, how easily we went grocery shopping. I still go grocery shopping— for six minutes only. Grab the bread, push my way to the front of the cue, pay, out. You learn a lot. I went out to my favorite restaurant, the Ramaya, the other day to find it was no longer the Ramaya. It was now given an Islamic name and had a green neon sign. When I went inside, the menu was no longer in English, French, and Arabic. It was only Arabic. No more bottles of Lebanese red wine. It been totally Islamicized. You need to see this and understand it. But the problem is most of our colleagues are not permitted even by their head offices to do that. AMY GOODMAN: We’ve just returned from New Orleans. Something that is most stunning about what has happened with the media, aside from the horror that has taken place, is that because the national guard were in Iraq, because president Bush did not get the resources there immediately there were no troops for the reporters to embed with. And so what happened is you had reporters who were the victims, in the street, reporting the facts on the ground like we have never seen a reporter with a body that floats by behind them. And then when government officials say this isn’t true, the reporters actually challenge the government officials because they are experiencing this themselves. One of the first things president Bush did when he started getting involved was say that the bodies of corpses, the corpses were not to be photographed. I think what has turned this country around right now is that people have truly seen the real images of New Orleans in a way that we have not seen in Iraq. Can you talk about the whole embedding process and the control of the media? This, you see, was the problem. The war was over then. We’re talking about the 1991 Gulf War, the liberation of Kuwait. When journalists had been put in pools, which was then the equivalent of embedding. And they chaffed that they wanted to report real war, weren’t being allowed to, that they were being censored. But when the war ended and they were allowed to drive up the highway and film anything they wanted, they censored themselves. Far too sensitive. Can’t receive this sort of thing at breakfast what about the children? And in London, and in Washington, and in New York, and everywhere else, Paris, the television directors and the editors said, “We can’t show that.” Impossible. Many of the worst pictures taken in the invasion of Iraq in 2003: a man holding a kid out like a piece of pancake. A beautiful girl in the arms of a man, we have to lop it off here because we didn’t want to see the bones of the foot sticking out. She was dead, wounded in many captions. Never saw the light of day. They couldn’t be shown. They could— but they were not. Because sensitivities. Mustn’t show this at breakfast time. It’s irresponsible to show the dead like this, it’s disrespectful. I tell you, if you saw what I saw when I go to wars when I’m on the front line with or without soldiers or with civilians or wounded in hospitals, if you saw what I saw, you would never, ever dream of supporting a war again. Ever in your life. It’s a remarkable thing that the cinema, the commercial cinema, feature films can now show the bloodiest, goriest themes which are quite similar to what we see in real life, “Saving Private Ryan,” the guts spilling out. And yet real war cannot be shown without censoring pictures which in many cases are exactly the same as what you see when you go to the cinema. Or when you watch a war movie on television. It’s remarkable. And only when you’re there do you realize — and I have an editor in London who shakes his head in disbelief and when I say this over and over again. If you go to war, you realize it is not primarily about victory or defeat, it is about death and the infliction of death and suffering on as large a scale as you can make it. It is about the total failure of the human spirit. We don’t show that because we don’t want to. And in this sense journalists, television reporting, television cameras are lethal. They collude with governments to allow to you have more wars because if they showed you the truth, you wouldn’t allow any more wars. AMY GOODMAN: Robert Fisk, two questions. One is, why do you think president Bush has done this? And what do you think, since you write in your book that’s just about to come out, “The Great War for Civilization,” about the increasing call of your readers, questions, outcry, what can we do? Why do you think he’s done this? What do you think he wants to accomplish now? And what do you think people can do? ROBERT FISK: Look. What Bush did in 2003 and what our own Lord Blair did, our prime minister whom we deeply love, what they both did is they made a terrible mistake which history should have taught them not to make. They went to war for ideological reasons. They dressed it up in military reasons, weapons of mass destruction, saving the poor Shiites, or the poor Sunnis, or the poor Kurds, or whatever you like, destruction of Saddam Hussein, giving democracy to the Middle East. There will be some more, come up soon, before we tell the Iraqi that they’re ungrateful and they should be more grateful than they are. We are already beginning to tell them in the letters columns, I noticed. But they went to war for ideological reasons. If you do that you will always fail. You see, everything goes wrong in a war based on ideology. Whether it be right-wing Christian ideology, fundamentalist ideology, whether it be the ideology of American western democracy has to plow up the dictatorships of the Middle East. I won’t go into that because we’ll all fall asleep. But what happens is that everything about your military purpose gets perverted. For example, look at American intelligence. It’s hopeless in Iraq. Absolutely hopeless. All they do is arrest the wrong people. People get beaten up, people get tortured. Yes, they do by the way. And yet, America has this extraordinary intelligence gathering apparatus. Massive super computers sucking in telephone calls. Millions from all over the middle east. Translators going through page after page, not fast enough as we know it before September 11, 2001. But doing it. And they amass this huge volume after volume of intelligence of what’s going on in the Middle East. Now, if you are able to understand injustice, which is what the Middle East is partly and principally about, you can make sense of it. But if you’re going to go ideologically at this intelligence and try to make it fit what you believe or what you want to believe, then the whole C.I.A. is eliminated. It’s worthless. That’s why, for example, the background, the foundation of the Iraq war is built on sand because it was an ideological war. It wasn’t based on what do Iraqis want what would really happen. It was also based on oil, I know that. Because if the chief exported Iraq with asparagus, we wouldn’t be there, would we? When you base a war ideology, that’s what happens? You lose. And when you lie about the basis of it, you lose. And the war in Iraq has been lost already. It’s only prison journalism or hotel journalism and the lies of the State Department and the Pentagon and the White House and the Downing Street and the Defense Ministry in London and so on that keep this spin rolling. At some point there’s going to be an explosion the like of which will be inexplicable by those in power. I don’t know what it’s going to be, but it will come. How do we deal with it t? I don’t know. You see, those readers who write to me and still do. I’ve got a bunch of mail outside the studio in my bag. What can we do? There seems to have been a complete breakdown in Britain. Between the electors and the elected. One of the reasons, of course, the Tory party supporting the Labor party, the press have become the opposition. You have a bigger problem in the United States in that, as I understand it — well, I’ll quote a U.S. Marine who said to me in San Diego a few months ago, “Our problem is we have this kind of false democracy,” he said, “We vote for our senators and congressman for what they say they’ll give us and they give us something and say something completely different. I think you have a big problem with the lobby groups. I don’t mean just the Israeli lobby, I mean the gun lobby and so on. I think you have a major problem with lobby groups in Washington and every president comes along saying he’s going to clean that out but he never does. Actually, Bush didn’t say that, not George W., anyway. But I think you have a much bigger problem in the United States where on issues like the Middle East, for example, your voice is simply not heard unless it is pro- Israeli, pro-American policy in the Middle East, etcetera, up on the hill. You’ll get a few brave souls, Paul Finley. Look what happened to him. But basically you won’t get represented on these critical issues. American policy in the Middle East is the critical issue in all our lives at the moment. I hinted — I go at much greater length in my new book on the issue why after September 11, 2001, I remember having this terrible argument with that Boston professor, Dershowitz, who called me “a dangerous man. He’s anti-American. It’s the same as being anti-Semitic.” Which is rubbish of course, I’m neither. But anyone who asked the question why did it happened was seen as being unpatriotic, potential enemy therefore anti-American, anti-people, anti-democracy. Because, of course to ask the question why, we have to say: well, hold on a second, the 19 hijackers came from the Arabs. They came from the Middle East. Is there a problem out there? We can’t go into that. It’s strange because if you have a crime in Santa Fe, the cops come along. First thing they do is look for the motive. When you have an international crime against humanity on the scale of September 11, 2001. The one thing you’re not allowed to do is look for the motive for the crime. And I think that by and large for many months Americans were prevented from looking for the motive. By the time they could look for the motive, we were bombing Afghanistan and saying there were weapons of mass destruction in Iraq. And then defeating Saddam Hussein. And so it goes on and on. And it seems somehow that modern-day politicians with, in many cases, the help, I’m afraid, of journalists, are able to continue to bamboozle people. “We’ll explain it tomorrow, that’s too secret to tell you,” secret intelligence officials insist. Look at The New York Times's first paragraphs over and over again, “According to American intelligence officials.” “American officials say.” I think sometimes The New York Times should be called “American Officials Say. Just look at it tomorrow or the day after. Or the L.A. Times, or the, not the San Francisco Chronicle, it's not much of a paper anymore unfortunately, but The Washington Post. It’s almost as if — you know the cozy relationship between American journalists and power is very dangerous. You want to look and see what that relationship is like. The osmotic, the host and the parasite together. You only have to look at a White House press conference, “Mr. President, Mr. President?” “Yes, Bob. Yes, John? Yes, Nancy,” that’s the relationship. Journalists like to be close to power. They know that if they want to be close to power, they mustn’t challenge power. And that goes back to the Amira Haas definition of journalism, which I am a total devote of: you must challenge power all the time, all the time, all the time even if the politicians and the prime minister, even if your readers hate you. You must challenge power. And that includes Bin Laden power. ROBERT FISK: Enough, enough, enough. AMY GOODMAN: What gives you hope? What gives you hope? ROBERT FISK: Nothing. I’m sorry. Nothing. I’m sorry. Nothing at the moment. Ordinary people, I guess. Ordinary people who speak out. People in the Arab world as well. But in terms of governments, nothing much. I may be wrong. I may be too much of a pessimist because I’ve seen too much. AMY GOODMAN: Robert Fisk, author of “The Great War for Civilization: The Conquest of the Middle East,” reports for the Independent newspaper for 30 years, based in the Middle East.